Penguin poop reveals secrets of the Antarctic climate. Adélie penguins leave debris that contains clues to shifting ice sheets. THE STUDY “A 45,000-Year-Record of Adélie Penguins and Climate Change in the Ross Sea, Antarctica” by Steven Emslie, Larry Coats, and Kathy Licht in the January 2007 issue of Geology. THE MOTIVE For millions of years, Antarctica’s ice sheet has ­advanced and retreated as Earth has cooled and warmed. ­Covering nearly 5.5 million square miles, the frozen mass exerts an enormous influence on the global climate, reflecting sunlight back into space and cooling Earth’s atmosphere and oceans. If the ice sheet were to melt, global temperatures would rise 8 to 10 degrees Celsius. Yet dating past expansions and contractions of the Antarctic ice shelf has proved difficult. Geologists can infer its changing size by dating marine sediments, but this method is not always accurate. Now Steve Emslie, a marine ornithologist at the University of North Carolina Wilmington, has developed an ingenious method of ­tracking climate change in the Antarctic: He has excavated and carbon-dated 45,000 years’ worth of Adélie penguin poop, skin, bones, feathers, and eggshells from colonies preserved in Antarctica’s frigid climate. Because these birds nest only on ice-free terrain, the presence of their ancient nesting sites indicates when the glacial ice sheet had retreated; their absence indicates the ice had returned. THE METHODS Beginning in 2001, Emslie began burrowing into the remains of 28 abandoned and 8 active Adélie penguin colonies on islands and coastline abutting the Ross Sea, which fills the cleft in the continent where it meets the South Atlantic Ocean. Adélies are two-foot-tall birds that feed on krill, fish, and squid and build their nests from small beach pebbles in colonies that may occupy the same site for thousands of years. Antarctica’s oldest penguin-breeding colony, Emslie discovered, was at Cape Hickey in the south of the Ross Sea, containing eggshells from 43,000 to 27,000 years ago, while a nearby island molting site had two feathers older than 44,000 years. That indicates that the sea was then open water. Over the next 14,000 years, the ice shelf advanced and did not begin retreating again until about 13,000 years before the present, when the last ice age ended. About 8,000 years ago, Adélie penguins returned to the Ross Sea coastline, building new colonies until two cool periods—between 5,000 to 4,000 years ago and 2,000 to 1,100 years ago—forced them to abandon most nesting sites. Only one colony, at Inexpressible Island, appears to have been occupied continuously for the past 7,000 years. Another, at Cape Adare in the north, is the largest active Adélie penguin colony in Antarctica; it is home to more than 150,000 nests and is 2,000 years old. THE MEANING “Penguin colonies have been blinking in and out of the Ross Sea over time with climate change,” says Emslie, and this research puts “a better absolute date on when there was open water, which is the first time we’ve been able to do that.” Prior to this work, geologists did not know exactly when the Ross ice shelf began to advance. Thanks to Emslie’s penguin ­findings, “we now know that it had to have been after 27,000 years ago.” The results also have profound implications for present-day climate change, says Ólafur Ingólfsson, a glacial geologist at the ­University of Iceland in Reykjavik. “We know very little about how rapid ­environmental changes are in Antarctica,” he says, and yet “what happens in Antarctica will spread like ripples throughout the global system.” Emslie’s data will now allow geologists to ­calibrate ­models of past climate change and so make better climate predictions. “What Steve is doing is absolutely brilliant,” Ingólfsson says. 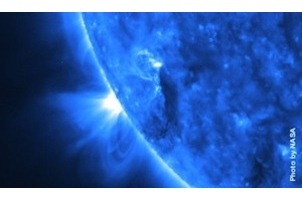 NASA says the Sun is "tangled up in blue"